The report, “Climate of the Southeast United States: Variability, Change, Impacts and Vulnerability,” was released yesterday. 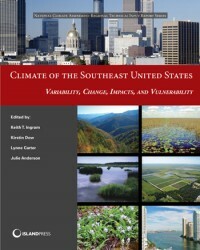 Produced by Island Press, the book summarizes the scientific literature with respect to climate impacts on the Southeast United States, including 11 southern states to the east of the Mississippi River, Puerto Rico, and the US Virgin Islands; reviews the historic climate, current climate, and the projected future climate of the region; and describes interactions with important sectors of the Southeast and cross-sectoral issues, namely climate change mitigation, adaptation, and education and outreach. SCIPP Program Manager Lynne Carter is one of the editors of this report. For more information, please visit: http://islandpress.org/climate-southeast-united-states.